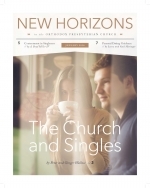 This is the first thing that the church needs to say to singles, repeating words of the apostle Paul: “To the unmarried and the widows I say that it is good for them to remain single as I am” (1 Cor. 7:8). What does a Christian woman do if she never marries, despite legitimate aspirations for a husband? What if you have prayed and tried to marry, only to find the door providentially closed? How does the Christian bachelor, with his share of rejections, continue to rejoice in the Lord always? What if you once were married, but tragedy brought an unexpected divorce or widowhood? Now you find yourself alone (maybe with children). Does God really expect you to be content? Romance isn’t what it used to be.